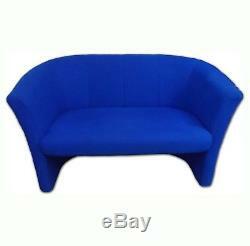 Used Blue Reception Seating 2 Seater Sofa, Tub Chair & Coffee Table. 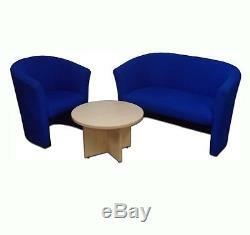 Used Blue Reception Seating Comprising of 1 x 2 Seater sofa, 1 x Tub Chair and a light beech round coffee table. These chairs are very well made and are finished in hardwearing blue fabric. 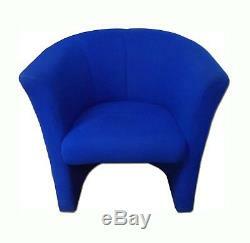 These chairs have very thick shaped foam padding and provide great comfort and support to your visitors. 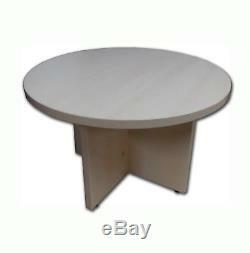 Included with this set is a low level light beech coffee table which is ideal for placing magazines or brochures on. The chairs have a stylish shape and stitching detail on the back. This reception set is used /refurbished and has been Checked tightened up where required and deep cleaned, The chairs are very good quality and will easily withstand everyday use. Upholstered on the Base and back in blue hard wearing fabric. This Great design not only looks good but also provides great comfort. These chairs are in very good condition with very few marks and have no pulls or rips to the fabric. A50 Office Furniture Ltd is a family business that has been built upon customer recommendation. Specialising in new furniture and good quality second hand office furniture we supply to private individuals requiring single items through to companies requiring full office refits. We supply a broad range of office furniture which includes reception suites, desks, specialist swivel chairs, home office furniture, conference tables, function chairs and much more. If preferred you can arrange for your own courier to collect your items but we will not take any responsibility for any damage that may be caused in transit. If you are local to us you can arrange to collect your items yourself. The item "Used Blue Reception Seating 2 Seater Sofa, Tub Chair & Coffee Table £275 + VAT" is in sale since Monday, November 13, 2017. This item is in the category "Business, Office & Industrial\Office Equipment & Supplies\Office Furniture\Office Chairs". The seller is "a50officefurniture" and is located in Foston, Derbyshire.